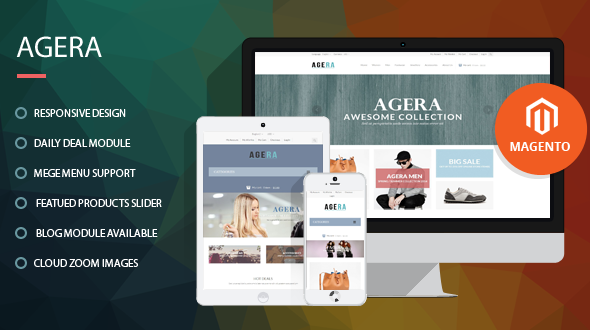 Agera is a truly premium Magento Theme, with a professional design and clean code. Based on the newest Bootstrap framework , Agera is a flexible and powerful platform to support any kind of website. Agera is a Magento ready theme suitable for every type of store : fashion store, clothing store, shoes store, accessories store,…. Home page is made highlight with large and nice images in Slideshow. Mega Menu is beautiful and clean. Extensions support customers see outstanding products such as discount products in Price Countdown extension; new products, featured products in Product Tabs extension; latest products, most viewed products, in Latest Products, Mostviewed Producst extensions,…. Besides, customers can communicate with us through Blog, Twitter. Brand slider extension shows many famous brand or logo brands you want to advertise. This design is nice and clean. Arrangement of modules and static blocks is logical.